KeepSafe Fall Prevention Alarm Wheelchair Belt System (POS8340) includes the KeepSafe Fall Prevention Alarm Control Unit, 9-volt battery, saddle bracket, sound dampening plug, and the Chair Belt Sensor (POS8360). 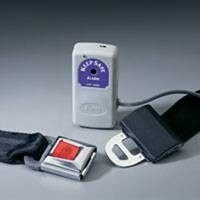 The Chair Belt Sensor forms an electronic circuit with the alarm unit. The alarm activates when self-release button is pressed. The chair belt also provides positioning assistance for those patients/residents with forward sliding tendencies. The wheelchair belt attaches to a wheelchair with existing hardware.